Howdy, Sam and all! That guy looks like he's waiting for orders to activate a nuclear strike. 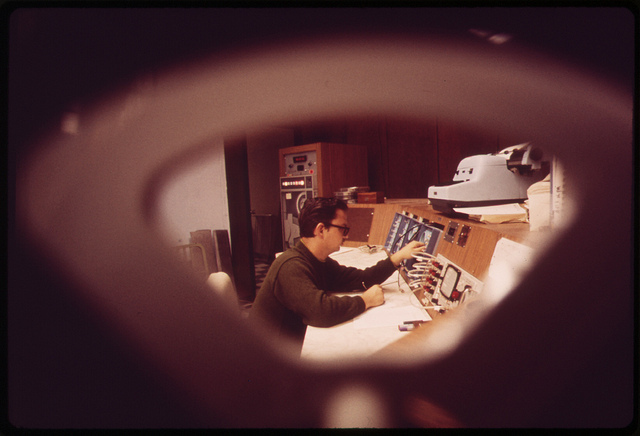 @LJW: According to the caption on the photo, this fellow is a "Technician at controls of 'whole body counter' at EPA's National Environmental Research Center at Las Vegas, May 1972." Ah, I can relate, @NGH! Beastie Boys always reminds me of adolescent schools-out euphoria. So far I'm 6/8 in recognizing the artists played so far, back to cleaning/unpack, be back in a bit! Everyone must have Monday hangovers. I tried to separate keys into weekday, weekend, and out-of-town keys. It failed miserably, as I couldn't find my weekday keys w/ my work keys. Now I'm back to carrying my house keys, my work keys, my bike keys, my cars keys, and my Brooklyn apt keys (as well as my bottle opener that looks like an old early 20c key) all on the same key chain again. Best to keep them all together. Good evening. I'm here for the late dining music. The menu: black bean taquitos, spanikopita and carrot ginger soup. But my starters were a few squares of dark chocolate and a few spoons of vanilla ice cream. I know "Dejando volar el pensamiento" means something close to "below the flight of thinking", I actually don't know Portuguese, unless it'.s close to Spanish, "A Maquina Voadora", "To the Flying Machine?" That's my best guess. @JustTryingToBeAGoodGuy...you have finally turned this comments board into the dance floor I always knew it could be. A pretty radical time it seems to be here in this club. @Gilly! Glad you could join us on the floor. It's good it's still shorts season so bare shins and calves are ready for slapping /drummng along. Glad to be boping along on this quest. Great set so far. Oh, it's a good meal. Though eating it at 11:00 PM may be not the best circumstance. Yeah, late eating can lead to problems. I've been snacking on dark chocolate with a coconut kefir/rosewater/seltzer concoction. Give it a name! I'm guessing, just guessing, you're the only one in this city enjoying that beverage recipe right now. While forty or fifty people nearby around here are eating the EXACT line-up that I'm eating. That's good as either a drink name or a modern burlesque performer name. It does have a burlesque sound to it. Pie is a universal diner staple, always acceptable to consume at all hours!! DJ all hopped up and impaired on blackberries and crust! That pie put me in some type of way! Pie is acceptable as a main course for breakfast. Uncle Michael, that's the single most empowering thing I've heard in a long time. I'm the pie life coach. And good pie in the house feels like security and good fortune. The last two helpings of the best pie I've made is still in the fridge...ginger peach. Peach ice cream is good. I don't think one should dare call a diner a "diner" if pie is not haphazardly covered in Saran Wrap so the whip cream is smushed down on the bottom shelf for display in the condiment fridge. Personal opinion. The platonic ideal of diners has a proper pie case. If any of the few lonely souls in Hopper's "Nighthawks" was eatin' pie, they'd fork the melancholy away! You could caption that painting "out of pie". Oh,the saddest phrase to speak or write. The most severe spell to cast upon a foe. Godspeed and good night, kindred pie spirits. All the best, Pie Coach Michael! Thank YOU. Lulla-pie and good night.